On April 19, 1775, the colonial period of American history drew to a close at the battles of Lexington and Concord. And thus, began a revolution that changed the course of history. Have you ever wondered what those colonists would think of America today? Would they recognize it? No, I'm not thinking of politics or technology or culture or religion. Hey, it's spring, and I just spent my morning planting tomatoes. Now there is a quintessentially American plant, used by the Aztecs for centuries before Europeans arrived. But the people of Europe feared the tomato might be poisonous, so it did not become a common food source, even in America, until the mid-1800's. There is a comfort in the familiar--just try offering a new food to a young child. Or maybe a middle-aged one for that matter. And so it was with those early colonists who brought many of their own preferred foods with them. Some years ago, I was trying to discover what colonial America would have looked like. I live in a wooded, semi-rural part of Southeastern Virginia not far from Jamestown, the first permanent English settlement in North America. You would think the view from my window would be similar to what John Smith saw in 1607. It isn't. Old World diseases, such as the chestnut blight and Dutch elm disease, have permanently changed the landscape of North America, wiping out entire forests. They have been replaced by introduced plants. 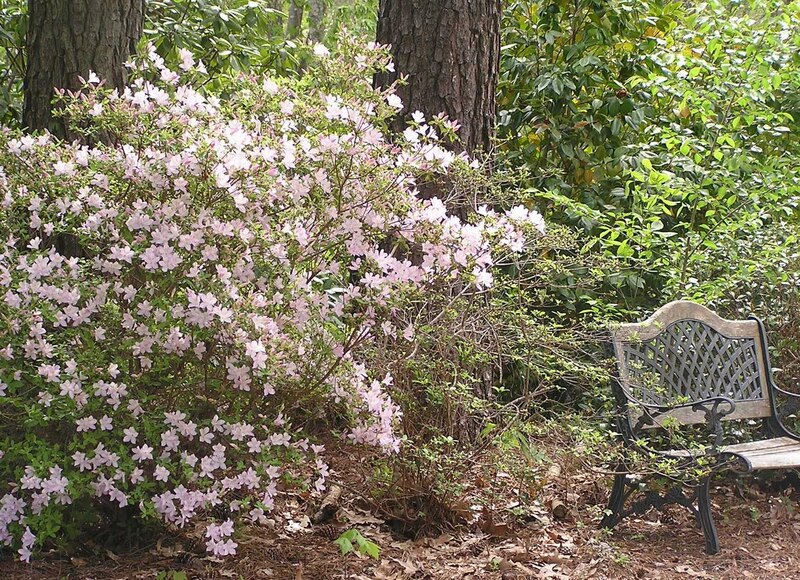 My azaleas, currently blooming in lovely shades of purple, trace their ancestry to Asia. So, too, my camellias, crepe myrtles, and Japanese cherries. And then there are the fruits. Did you know the orange, lemon, cherry, apple, pear, and peach (to name just a few!) are all non-native to North America? So much for the all-American apple pie. Some introduced plants fared so well in their new home they have become pests--like the mulberry, mimosa, Japanese honeysuckle, multiflora rose, and common dandelion. Yep, the dandelion, the scourge of suburban lawns everywhere, didn't arrive in North America until the mid-1600's when the Puritans brought the plant to New England. Those Puritans were more concerned with survival than nice lawns. Pick dandelion leaves early in the spring and mix with other greens for a salad. Or cook and serve them with a bacon dressing. Or use the leaves in place of spinach in dishes such as lasagna. You can coat the flowers in cornmeal batter and fry them in oil to make dandelion fritters or use them into make dandelion wine. If you are a teetotaler, roast the roots to make a nutritious coffee substitute. But be sure to save some of the root for your vegetable soup. Best of all, that dandelion dinner will keep you healthy--the leaves have more beta carotene than carrots and more iron than spinach. Not feeling well? A dandelion tea supposedly helps kidney function, including the treatment and prevention of kidney stones. Keep looking your best with a dandelion lotion to treat dry or sallow skin. And the savvy fashionista can create her own red fabric dye from dandelion roots. 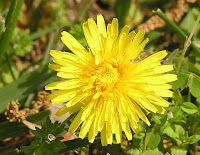 With no way of foreseeing how pervasive dandelions would become, it is understandable why the Puritans brought such a versatile plant with them. And yet, most of us see the dandelion as an annoying, nearly-impossible-to-kill weed. It strikes me that we frequently treat people the same way, seeing only how they inconvenience us. Have you ever had a disagreeable neighbor? An irritating relative? A demanding child? (Why can children play quietly for hours--until Mom gets on the phone?) How dare they interrupt our plans, embarrass us in public, and disturb our quiet! It's rather like that beautiful green carpet of grass being blemished by those splotches of dandelion yellow. The same Ralph Waldo Emerson who wrote "Concord Hymn" also said, "What is a weed? A plant whose virtues have never been discovered." Or in the case of a dandelion, a plant whose virtues have been forgotten. Too often, however, we see the weed. We fail to see people as God does, intricate flowers of fallible humans whom He loves. Jesus told us that "God so loved the world" (John 3:16). Even those we perceive as unloveable, God sees as His creations, made in His image. Have you tried dandelion? And have you ever consciously looked "beyond the weed" and been surprised by what you found? Well, clearly I have an appreciation for dandelions ;) I used the name for my book because my girl is a peasant. Her dad chose the name thinking it a compliment, but she sees it as common, and the local noble woman says it's crass. An Italian sea captain turns it to poetry. I actually take dandelion in a supplement sometimes when my gull bladder is bothering me. And I really want to try dandelion wine and fritters. I guess I'd better get to harvesting my lawn. LOL. I actually think dandelions are pretty. Interesting that they have more nutrients than spinach and carrots. This was a great post, CJ. Yes, I can see all kinds of 'weeds' in my life that turned out to be something very good. It was the getting past the 'weed' part that was painful. Dina, I've had the greens in various ways, but never tried the fritters or the wine. The leaves have kind of a bitter taste, think like arugula. Suzie, one look at our yard, and you know we'll never starve. I've told my son that he could be a wealthy man if he'd find a use for the other weeds out there. And glad you got past the "weeds." You're so right in that it's easy for us to view irritating people as weeds in our lives, instead of "intricate flowers of falliable humans whom God loves." I've never eaten a dandelion. Can't say I've even been tempted do. But when I was a kid, I LOVED plucking the heads of them. Each of my kids when they were little would bring me a dandelion. "Mama, look at the pretty flower I picked for you." I have put more dandelions in cups to sit on my windowsill. C.J., terrific post! Our dandelions aren't out yet, still too cold. I have tried the leaves, they aren't bad, and I didn't know how high they were in nutrients. Certainly cheaper than buying fresh spinach! We have an infestation of wild stinging nettles growing along our creek every year. Just this morning I ran into a YouTube video about harvesting them and cooking them. I guess they're really good for you, and are used by herbalists to treat allergies and all sorts of things. I'll let you know how it goes! Fun post, CJ! I drink a dandelion detox tea on occasion, but haven't had the courage to harvest my own leaves yet. I used to pick the flowers and put them in my Barbie bridal bouquets; I always thought they looked like little mums. I've often wondered whether a particular landscape would be familiar to my historical characters. Animals, too. Coming home from the orthodontist this morning, my kids and I saw a group of five green parrots flying alongside us for a stretch. Someone must have had one (or two) as pets and either lost them or set them free, but regardless of how they got here, they're thriving quite well! Great post! I may never look at a dandelion the same way again. I wish I could see them in my yard right now, but the snow and cold weather have stunted them. I've had dandelion in salads. The fritters sound good, but then again, what isn't when it's fried. Gina, now I'm missing the days when my oldest used to bring me dandelions. I still have one who thinks it is his life's work to scatter those seeds. He used to blow them, but now he'd discovered that whacking them is more efficient. Niki, I'd be interested in seeing that video. Susanne, I think while I was researching I read that dandelions are part of the aster family. I noticed when I was looking a closeup pictures, they really are pretty if you look at them objectively. I am so conditioned to thinking of them as a weed, I don't take the time to look. Sometimes we can all be picky eaters! Faye, when my boys are being picky eaters, I remind them how good they have it -- that they can afford to be picky. Yeah, okay, I'm kind of a picky eater myself. Dandelions are fine, but I've never been able to eat liver or brussel sprouts. C.J., here's the link for the nettle soup video! I'll let you know if I try it once the weather warms up a bit.